Phillies manager Gabe Kapler (bottom), here meeting with the media earlier in spring training, vows to be more candid in his second season. The Phillies president was just like you last season. Sometimes, he couldn’t believe what he heard after he’d seen what he’d seen. Jake Arrieta was a “horse" — after just 10 wins by September? Carlos Santana was having a “very good year” — hitting .215 in August? These weren’t the only overstated assessments in 2018 from Gabe Kapler, but they got the most attention. So, why did Kapler so often say black was white, up was down, and Scott Kingery was a viable major-league player? No matter how gloomy the weather, the skipper was Mr. Sunshine at every press conference. But it’s not always sunny in Philadelphia. That’s a hard way to live in a sports-saturated, East Coast market such as Philadelphia, especially when the team melts down in the last six weeks of the season. Team president Andy MacPhail, a native New Yorker and a blue-blood baseball lifer, took Kapler to dinner after the season. MacPhail suggested that Kapler be more candid. “Andy MacPhail gave me some really sound advice that resonated strongly with me,” Kapler told me in the middle of spring training, tucked into an alcove at Spectrum Field. "He said, ‘You can still protect the bleep out of the players, but still be very balanced.’ "
MacPhail wasn’t the only person in the Phillies organization to offer that advice, said Kapler, who is surrounded daily by legacy employees. The message was the same: Rip ‘em when they need to be ripped. Be authentic, or you’ll be gone. Phillies president Andy MacPhail gave manager Gabe Kapler some advice over dinner. 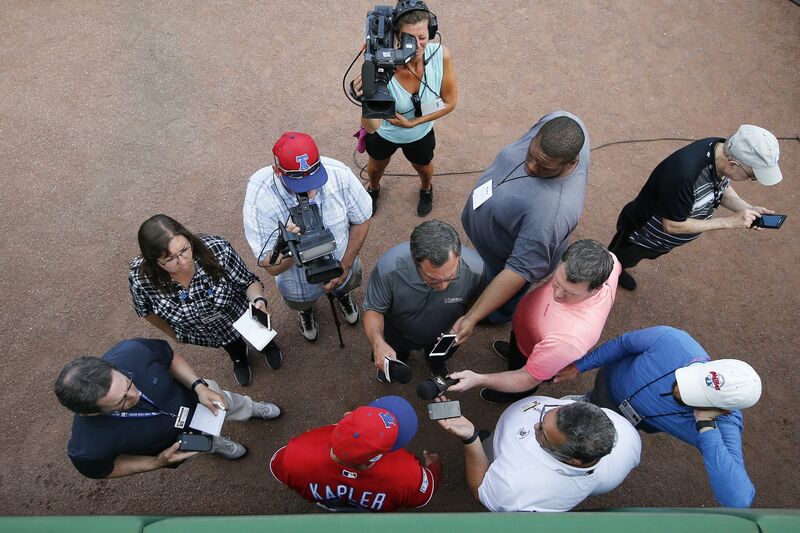 One Phillies source observed that, when the manager bombards a cynical press corps with unsupported positivity every day, that cynical press corps will, every day, prepare a barrage of negative questions. MacPhail came away from their dinner certain that Kapler would change. After all, Kapler, a 57th-round pick, continually reinvented himself over a 12-year career spent with six major-league teams and one Japanese club. And, this spring, Kapler has adjusted. To some degree. “I can share balance with you on what just happened in the game," Kapler says. This was not a one-time occurrence. Later in the spring, Kapler agreed that reliever Seranthony Dominguez hadn’t hit his stride, that Hector Neris’ split-fingered fastball was inconsistent, and that Victor Arano’s flawed delivery kept him from throwing his slider for a strike. Once, after Neris gave up two home runs, Kapler even sounded ... displeased? Granted, those reviews might not seem scathing. And Kapler seems much more comfortable speaking in generalities than in specifics. You don’t have to run a guy over to say he stunk that day, or that month, or that season. Everybody could see it last season, even if Kapler couldn’t. Or wouldn’t. Or wouldn’t admit it. Kapler called Arrieta “a horse” after Arrieta, the $30 million free-agency gem, gave up four runs in five innings on Sept. 17. That happened in the middle of a nine-game stretch for Arrieta in which he went 1-5 with a 6.35 ERA and gave up 10 home runs in the middle of the Phillies’ collapse. The context of the quote referred more to Arrieta’s durability, as well as his proficiency earlier in the season, and it might have been less startling. Except, on Aug. 12, Kapler told everyone that Santana, the $60 million free agent, was having “a very good year.” Santana was hitting .215. Which was an improvement since, through May 22, Santana had been hitting .195. This season, expect Kapler to be less forgiving if, say, new shortstop Jean Segura finishes April at .153, the way Santana did last season. Will he, in fact, demonstrate it? When Arrieta started slowly this spring, Kapler deferred to his experience. When $330 million free agent Bryce Harper went hitless in his first nine at-bats, Kapler gushed about Harper’s hustle. Then again, Arrieta is in the second season of a three-year, $75 million contract, and Harper’s in the first season of a 12-year, $330 million deal, and both were negotiated by owner John Middleton. Both those players could probably get Kapler fired, so maybe Kapler believes he should pick his battles. That would be a mistake. Honesty would be his best policy, and he’s been told as much, and not only by MacPhail over steaks and salad.